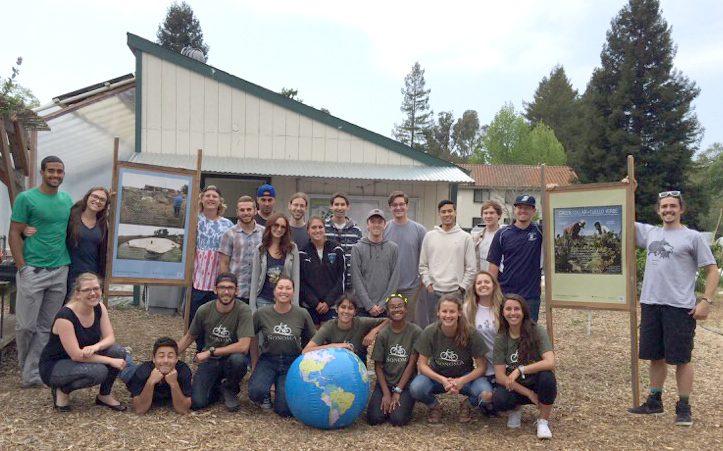 "We want to promote different avenues for involvement, whether on or off campus," says Liz Platte-Bermeo, director of sustainability for JUMP (Join Us Making Progress), a student group focused on volunteering in the community who is organizing Sonoma State's Earth Day events. To start, there will be a bike energizer station near the main entrance of campus on Person Lawn, 8-10 a.m. with snacks and refreshments for those who bike, walk or take alternative transportation that day. From 11 a.m. to 3 p.m. JUMP is holding an e-waste and clothing drive in the Darwin-Stevenson Quad in front of the library. Several campus groups and students will be at information booths with topics like the benefits of a plant-based diet, DIY household products, compost facts and myths, and more. There will also be live music and a free yoga class from noon to 1 p.m.
"We want to educate people on everyday things they can be doing to be more sustainable," says Platte-Bermeo. On Wednesday, April 20, Campus Rec hosts a screening of "The Lorax" in Seawolf Plaza on the big screen at 7:30 p.m. Free snacks and popcorn are provided. JUMP is hosting environmental-focused volunteer opportunities on April 22. For more information, visit https://orgsync.com/24644/events/1444295/occurrences/3280029 or email jump.sustainability@sonoma.edu.